Pre heat the oven to 180 degrees celcius fan bake and line a small spring form tin with baking paper. Place a pot on the stove on low heat and add honey and tamarillos. Let them gently simmer for 5 minutes, take off heat and set aside. In a bowl, beat the eggs, vanilla extract and coconut oil. Fold in coconut yoghurt, baking powder, salt and almond meal. Pour into cake tin. Spoon tamarillo honey mixture over and sprinkle with coconut. Cook for 30 minutes and remove from oven. If the knife or toothpick comes out clean, the cake is ready. Let cake cool in tin and then remove. Serve with a dallop of yoghurt. Cake is best stored in an airtight container at room temperature for up to 1 week. Tamarillos are here! 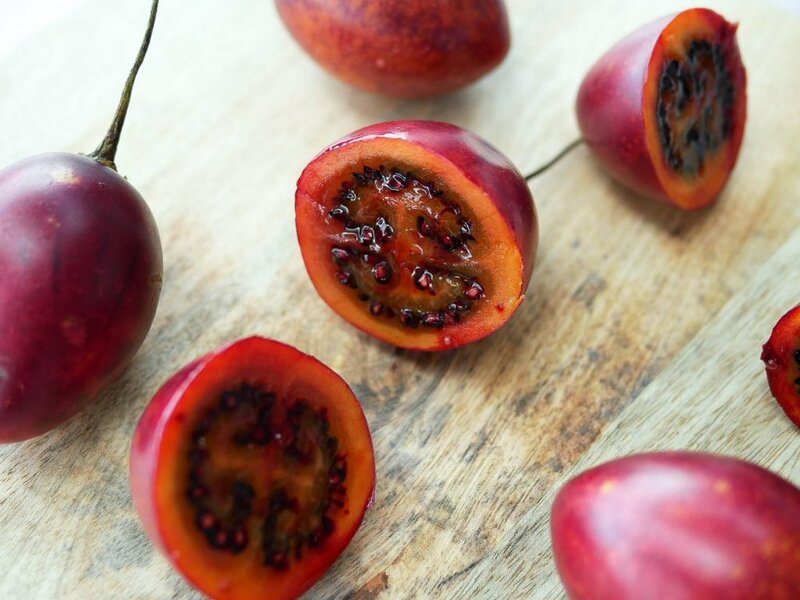 Every time Tamarillo season rolls around I have ideas in my head of recipes to create with them but end up being rather boring and scooping the flesh out and serving with plain yoghurt and coconut sugar. The other day I had a large amount of almond meal left over and knew pairing that with a fresh picking of Tamarillos could only be a good thing. So here it is, a soft spongy Tamarillo and Coconut Cake. I made this in the morning and our Mum served to her dinner guests that evening, they loved it, so I think you will too.